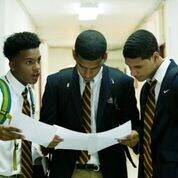 The Charter High School for Law and Social Justice is the product of a unique partnership between two institutions of higher learning - the College of Mount Saint Vincent and New York Law School - which have combined their resources to design the School. Using a law and social justice theme, the School will expose students to the power of law to promote social change. It will provide students from traditionally underserved communities with a high-quality education focused on creating a pathway to college, graduate school, and careers in the legal profession. The School’s objective is to provide students with a rigorous, high-quality education focused on equipping students with the skills they need for success in college and careers. The curriculum will include four years of ELA, math, science, and social studies, Spanish, law-related electives, and a four year law and social justice course sequence. The School will use a law and social justice theme to engage and inspire its students and help them reach their full potential. Educational programs will be designed to improve student achievement and learning, present increased learning opportunities, encourage the use of innovative teaching methods, and provide individualized support. Key design elements of the school will include a highly-skilled faculty, small class sizes, extended school days, a strong advisory program, mandatory summer bridge programs, mentoring, and real-world experience through community service projects and internship placements. Students at the School will also have access to a network of faculty, students, and alumni from the College of Mount Saint Vincent and New York Law School through the School’s partnership with these two institutions of higher learning. The initial vision for the School began soon after the Justice Action Center at New York Law School, which is directed by co-applicant Richard Marsico, had sponsored a symposium on the school-to-prison pipeline. This pipeline is a collection of policies and practices that result in the criminalization of normal adolescent behavior, leading to high rates of participation in the criminal justice system for high school students, particularly from traditional underserved communities and communities of color. Additionally, the Center had just completed its Street Law Program, in which law students teach middle school students about their constitutional rights. Professor Marsico found that many of the student participants wrote thank you notes stating that they loved the law school and that they wished they could attend New York Law School someday. The combination of these two events, in conjunction with a discussion on charter schools and alternatives to traditional public schools in his education law and policy course, led Professor Marsico to the idea that we should open a charter school. His vision was that the charter school could serve as a high school-to-law school pipeline that would counteract the school-to-prison pipeline. Professor Marsico shared this vision with his students and for the next four years they enthusiastically worked on the project. Over the years, Professor Marsico and his students were joined by New York Law School alumni, other interested people, and the College of Mount Saint Vincent. Their collective work developed the Charter High School for Law and Social Justice.